Gutter guards are an important part of a functional gutter and downspout drainage system. Gutters are designed to keep water flowing freely off the roof and away from your home’s foundation which can cause water damage. However, without a good guard on your gutter, lots of debris will clog your gutter (leaves, twigs, acorns, etc. ), cutting down on its efficiency and creating big problems for you as a homeowner. We’ve all seen a neighbor spending a beautiful Saturday morning high up on a dangerous ladder clearing twigs, branches, leaves, dirt and who-knows-what other gunk from his gutters. You may not have realized it, but none of this cleaning is necessary if your have properly fitting gutter guards. If you’re tired of spending time up on the ladder clearing out your gutter system, it’s time to make an investment that will save you money and time. There are many gutter guards to choose from, and we’re proud to install gutter covers that we’ve tested to be the best on the market today. If you’re not sure which gutter guard works for your property, our team will walk you through the options and help you choose the best gutter cover system for your home that meets your needs based on weather conditions, location, nearby trees, foliage and more. 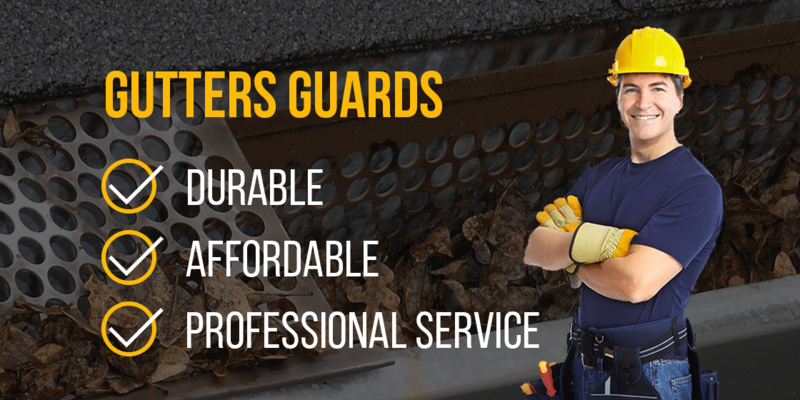 Make the call today and we’ll schedule a FREE in-home estimate to create the plan that will keep your gutters clean for good!